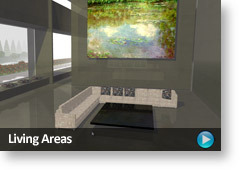 Visualize Room Layouts Fast in Lifelike 3D Online - Easy! "I am completely hooked on plan3D and highly recommend it to you! 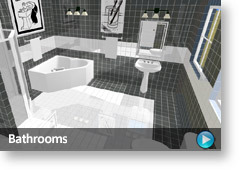 You will not believe how easy it is to draw up a new plan for your bathroom with plan3D..."
"The kitchen design part of plan3D was very simple to use - we were able to layout our kitchen cabinets quickly, then view things from different angles. This allowed us to make changes, additions, and deletions easily until it looked exactly the way we wanted. Thanks for making such a useful product." 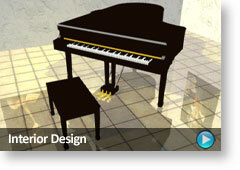 Welcome to the most realistic Interior Design program you'll find built into a web page. We include everything you need to get started immediately. 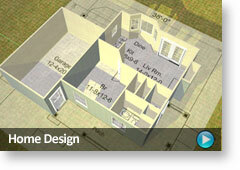 Lay out kitchens, bathrooms, basements, bedrooms, offices, games rooms - and even retail stores and restaurants. You get thousands of 3D objects like furniture, cabinets, windows, doors, carpet, and much more so you can create the layout you want. 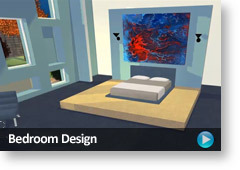 A room interior is designed first with walls, doors and windows - then drop in paint, carpet, tile, and curtains. Add furniture and cabinets as needed - then experiment with other variations of furniture, fabrics, wood textures, carpet, tile, and paint until it looks exactly the way you want. Repeat if you want to do other rooms in a house - or quit after one room. You get over six gigabytes of 3D furniture like sofas, chairs, patio furniture, tables, cabinets, appliances, windows, and doors - all re-sizable. Laptop or desktop with Windows 7, Vista, or XP.